Since I’ve started offering tarot readings here on the blog, I thought I’d write about how I use tarot in my daily life. For me, tarot is a way that I supplement my current spiritual practice. My current spiritual practice includes daily meditation and yoga asana. I use both of those as a way to remember my true Self. I am sure some of you will be confused by that terminology so let me explain how I see it. I see the Divine as a couple of things. My perception of the Divine is that it is an entity – one that I cannot describe but I feel like it appears in many aspects. I have seen it portrayed as woman, man, wind, animal, energy. It’s mainly for that reason that I don’t ascribe to a religion. I also see the Divine as my higher Self. A way that I think of this is, it’s my future self, whether my older self in this life, or if reincarnation is a thing, my future self in many lives ahead of me. It’s a higher aspect of me that grants wisdom to this current iteration of who I am. Now that that is explained… tarot does what for me, now? Okay, if we are defining “sin” or “ego” or the “small self” as that which separates us from the Divine or from Oneness (which is also me), then I would say I use Yoga to reunite with the Divine/my higher Self. Yoga in itself means “union” or “to yoke”, so this makes sense. By the way, I mean Yoga in the grander sense – not just the physical form but the entire philosophy and way of life. Tarot reading for me, is an extension of Yoga in the grander sense, a way that I remember and reunite with my Self and the Divine. It’s a reminder to me of which path will be the most nourishing and sustaining for me. After I drew this, I knew instinctively that I have blocks to abundance in my life. Abundance? It is not showing up much for me at the present. I’ve got bills galore, for one thing. 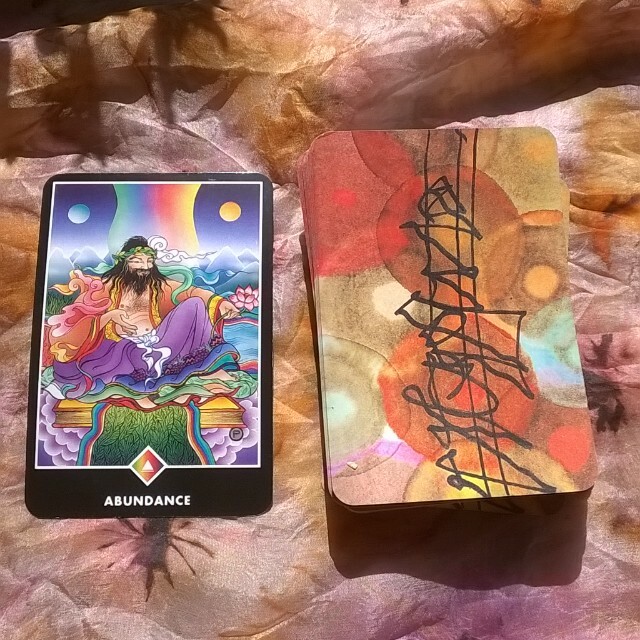 So I drew clarifying cards, asking, “how do I remove the blocks to my abundance?” The deck didn’t answer me straight. Instead it gave me Laziness, Conditioning, and Exhaustion. I only knew this related because I’ve been noticing a tendency of mine. When I get overwhelmed, I shut down and I act like I’m tired. I’m really not tired; I’m really just avoiding something that’s hard for me. To me, the deck was saying that the way I’ve been doing things, the shutting down and pretending it away and working really hard until I collapse into the ground, was not working. Well, what would work, then? I knew I had to relax. To rest. I had just gotten a massage this morning. My muscles were so tightly wound that even I was surprised. I was a massive ball of knots, especially in my shoulders. Hilariously, also, my massage therapist (also a lovely friend – Hi, Beth!) kept telling me, “Stop helping me!” I kept tensing up; she was telling me to stop helping her and just relax. This shifted my outlook for the rest of the day. It shifted my energy even. Previously, I’d been stuck in a dark hole of thinking that I’m not good enough, I’m unworthy, I should be better, etc etc. I’d been focusing on things that made me feel small, constricted, and dark. 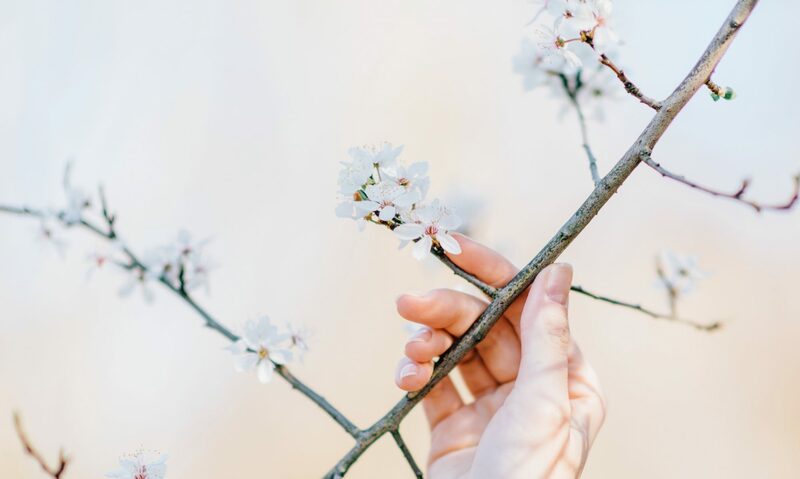 This reading shifted it to, “I am good enough, I have more than enough, and what if I were to live from that perspective?” My body instantly felt lighter, more expansive, more fertile, able to grow and take in beauty. That’s what tarot does for me. I have experienced profound reminders of the truth from tarot, profound moments that bring me healing. It’s a way for me to extrovert what I am processing through my Yoga practice. Through the cards, I can tangibly see the things I’m emotionally processing. Today, it just happened to bring a whole mental shift. And I’m left feeling lighter because of it.